City University of Seattle’s Technology Institute has an ABET accredited program – the Bachelor of Science in Information Systems – and is designated a National Center of Academic Excellence in Cyber Defense Education by the National Security Agency and Department of Homeland Security. Top-ranked undergraduate and graduate programs are offered to students in this Institute. Graduates from these top ranked programs go on to grow careers in programming, information technology, software development, computer systems, compliance and/or technology management. The undergraduate and graduate programs in the Technology Institute are designed by industry professionals to ensure that what students learn today can be applied tomorrow on the job. Each program incorporates key skills, knowledge and abilities necessary to advance in growing fields like programming, networking, information technology, and cyber security. Courses are intended to be challenging and relevant, with a high degree of hands-on learning. Programs such as the master’s and the bachelor’s in computer science are both highly ranked and taught by industry professionals with over 15 years of experience. Students in these top ranked and highly celebrated programs don’t just read about technology they apply it. CityU operates a special center whose mission is to conduct programs, courses, research and consulting in Information Assurance. Learn more about the Center. 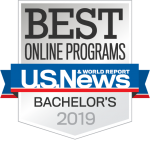 U.S. News & World Report announced City University of Seattle was ranked #28 in the nation for the Best Online Information Technology Programs.